Do your share and support your volunteers! Our Holiday Fund Drive mailers are out! 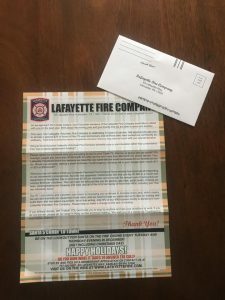 Do not just throw them out without reading them, do your share in our community and donate to your local fire company. As many of you know, our company is supported largely by donations from our Community and generous donations from East Lampeter Township and Lancaster Township. On average our monthly bills fall somewhere around $10,000. Our calls continue to rise, while our funding continues to drop. We thank everyone who graciously donates to our company, and with that we ensure a dedicated volunteer service to continue. We couldn’t do it without YOU!